There have been multiple trials investigating the utility of cyclin inhibitors as anti-tumoral agents (see post) with the idea of blocking mitotic entry however another potential antitumoral mechanism has been to drive the cell into mitosis in the presence of DNA damage or a defective DNA damage repair capacity. A recent trial investigating an inhibitor or the cell cycle checkpoint inhibitor Wee1 showed positive results in select cohorts of patients with mutations in DNA repair, indicating the therapeutic advantage of hijacking the cell’s own DNA damage response, much like how PARP inhibitor Olaparib works in BRCA1 mutation positive ovarian cancer patients. John Carroll at FierceBiotech reported that an Oxford team spotlights promise of AstraZeneca drug in targeting cancers. Investigators at Oxford University say that one of AstraZeneca’s ($AZN) pipeline drugs proved particularly effective in killing cancer cells with a particular genetic mutation. The ex-Merck ($MRK) drug is AstraZeneca’s WEE1 protein inhibitor AZD1775, which proved particularly lethal to genes with a SETD2 mutation, which the researchers see as a potential ‘Achilles heel’ often found in kidney cancer and childhood brain tumors. AstraZeneca landed rights to the drug back in 2013, when incoming Merck R&D chief Roger Perlmutter opted to spin it out while focusing an immense effort around the development of its PD-1 checkpoint inhibitor KEYTRUDA® (pembrolizumab)‎. Since then, AstraZeneca has made it available to academic investigators through their open innovation program. Since picking up the drug, AstraZeneca has posted positive mid-stage data for p53 mutated ovarian cancer at the last big ASCO meeting, (and see associated abstract on Multicenter randomized Phase II study of AZD1775 plus chemotherapy versus chemotherapy alone in patients with platinum-resistant TP53-mutated epithelial ovarian, fallopian tube, or primary peritoneal cancer) noting its qualification as a first-in-class player in their pipeline. In fission yeast, Wee1 delays entry into mitosis by inhibiting the activity of Cdk1, the cyclin-dependent kinase that promotes entry into mitosis (Cdk1 is encoded by the cdc2+ gene in fission yeast and the CDC28 gene in budding yeast) (Russell and Nurse, 1987a). Wee1 inhibits Cdk1 by phosphorylating a highly conserved tyrosine residue at the N-terminus (Featherstone and Russell, 1991; Gould and Nurse, 1989; Lundgren et al., 1991; Parker et al., 1992; Parker and Piwnica-Worms, 1992). The phosphatase Cdc25 promotes entry into mitosis by removing the inhibitory phosphorylation (Dunphy and Kumagai, 1991; Gautier et al., 1991; Kumagai and Dunphy, 1991; Millar et al., 1991; Russell and Nurse, 1986; Strausfeld et al., 1991). Loss of Wee1 activity causes cells to enter mitosis before sufficient growth has occurred and cytokinesis therefore produces two abnormally small daughter cells (Fig. 1A) (Nurse, 1975). Conversely, increasing the gene dosage of wee1 causes delayed entry into mitosis and an increase in cell size, indicating that the levels of Wee1 activity determine the timing of entry into mitosis and can have strong effects on cell size (Russell and Nurse, 1987a). Similarly, cdc25– mutants undergo delayed entry into mitosis, producing abnormally large cells, and an increase in the gene dosage of cdc25 causes premature entry into mitosis and decreased cell size (Russell and Nurse, 1986). Despite these difficulties, early work in fission yeast suggested that the Wee1 kinase plays an important role in a checkpoint that coordinates cell growth and cell division at the G2/M transition (Fantes and Nurse, 1978; Nurse, 1975; Thuriaux et al., 1978). WEE1 is an evolutionarily conserved nuclear tyrosine kinase (Table 2) that is markedly active during the S/G2 phase of the cell cycle [24, 25]. It was first discovered 25 years ago as a cell division cycle (cdc) mutant-wee1– in the fission yeast, Schizosaccharomyces pombe . Fission yeast lacking WEE1 are characterized by a smaller cell size, and this phenotype has been attributed to the ability of WEE1 to negatively regulate the activity of cyclin dependent kinase, Cdc2 (Cdc28 in budding yeast and CDK1 in human), in the Cdc2/CyclinB complex . Recently, WEE1 was shown to directly phosphorylate the mammalian core histone H2B at tyrosine 37 in a cell cycle dependent manner. Inhibition of WEE1 kinase activity either by a specific inhibitor (MK-1775) or suppression of its expression by RNA interference abrogated H2B Y37-phosphorylation with a concurrent increase in histone transcription . Figure 1. Schematic representation of the effects of Chk1 and Wee1 inhibition on CDK-CYCLIN complex regulation, that gets more activated being unphosphorylated from Cell cycle, checkpoints and cancer by Laura Carrassa. Figure 2. Schematic representation of the role of Chk1 and Wee1 in regulation of the CDK-cyclin complexes involved in S phase and M phase entry from Cell cycle, checkpoints and cancer by Laura Carrassa. Combined inhibition of the cell cycle related proteins Wee1 and Chk1/2 induces synergistic anti-cancer effect in melanoma. Magnussen GI, Emilsen E, Giller Fleten K, Engesæter B, Nähse-Kumpf V, Fjær R, Slipicevic A, Flørenes VA.
BMC Cancer. 2015 Jun 10;15:462. doi: 10.1186/s12885-015-1474-8. A functional screen identifies miRNAs that inhibit DNA repair and sensitize prostate cancer cells to ionizing radiation. Hatano K, Kumar B, Zhang Y, Coulter JB, Hedayati M, Mears B, Ni X, Kudrolli TA, Chowdhury WH, Rodriguez R, DeWeese TL, Lupold SE. Nucleic Acids Res. 2015 Apr 30;43(8):4075-86. doi: 10.1093/nar/gkv273. Epub 2015 Apr 6. Confirmed that mutations in gene TP53 are present in more than 96 percent of ovarian cases (>57% mutation frequency) while SETD2 mutations are present in only 1% of cases (1.1% mutation frequency). In general, ovarian cancers with TP53 are considered to have increased resistance to commonly used cytotoxic agents used for this neoplasm, for example cisplatin and taxol, as TP53 is a major tumor suppressor/transcription factor involved in cell cycle, DNA damage response, and other chemosensitivity mechanisms. One subtype of TP53 mutations, widely termed gain-of-function (GOF) mutations, surprisingly converts this protein from a tumor suppressor to an oncogene. We term the resulting change an oncomorphism. In this review, we discuss particular TP53 mutations, including known oncomorphic properties of the resulting mutant p53 proteins. For example, several different oncomorphic mutations have been reported, but each mutation acts in a distinct manner and has a different effect on tumor progression and chemoresistance. Figure 1. The spectrum of protection against cancer provided by WT p53. As copies of WT p53 (TP53+/+) are lost, cancer protection decreases. When oncomorphic mutations are acquired, cancer susceptibility is increased. Oncomorphic p53 proteins were first identified over two decades ago, when different TP53 mutants were introduced into cells devoid of endogenous p53 [38,39]. Among all cancers, the most common oncomorphic mutations are at positions R248, R273, and R175, and in ovarian cancers the most common oncomorphic TP53 mutations are at positions R273, R248, R175, and Y220 at frequencies of 8.13%, 6.02%, 5.53%, and 3.74%, respectively [33,34]. In in vitro studies, cells with oncomorphic p53 demonstrate increased invasion, migration, angiogenesis, survival, and proliferation as well as resistance to chemotherapy [35,37,40,41]. Figure 2. Hotspots for TP53 mutations. Mutations that occur at a frequency greater than 3% are highlighted. Certain p53 mutants have oncomorphic activity (denoted by *), functioning through novel protein interactions as well as novel transcriptional targets to promote cell survival and potentially chemoresistance. Codons in the “other” category include those that produce non-functional p53 or have not been characterized to date. Wee-1 kinase inhibition overcomes cisplatin resistance associated with high-risk TP53 mutations in head and neck cancer through mitotic arrest followed by senescence. Osman AA, Monroe MM, Ortega Alves MV, Patel AA, Katsonis P, Fitzgerald AL, Neskey DM, Frederick MJ, Woo SH, Caulin C, Hsu TK, McDonald TO, Kimmel M, Meyn RE, Lichtarge O, Myers JN. Mol Cancer Ther. 2015 Feb;14(2):608-19. doi: 10.1158/1535-7163.MCT-14-0735-T. Epub 2014 Dec 10. Mol Cancer Ther. 2015 Jan;14(1):90-100. doi: 10.1158/1535-7163.MCT-14-0496. Epub 2014 Nov 5. Mol Cancer Ther. 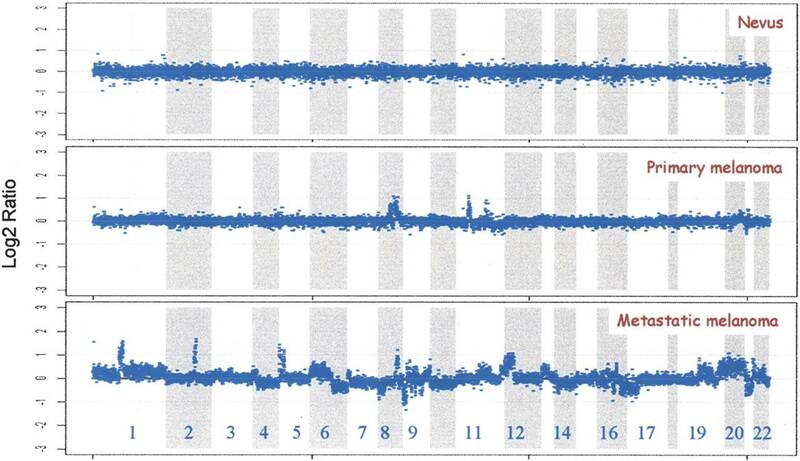 2013 Aug;12(8):1442-52. doi: 10.1158/1535-7163.MCT-13-0025. Epub 2013 May 22. Preclinical evaluation of the WEE1 inhibitor MK-1775 as single-agent anticancer therapy. Guertin AD1, Li J, Liu Y, Hurd MS, Schuller AG, Long B, Hirsch HA, Feldman I, Benita Y, Toniatti C, Zawel L, Fawell SE, Gilliland DG, Shumway SD. The protein phosphatase 2A inhibitor LB100 sensitizes ovarian carcinoma cells to cisplatin-mediated cytotoxicity. Chang KE1, Wei BR2, Madigan JP1, Hall MD1, Simpson RM2, Zhuang Z3, Gottesman MM4. 1Laboratory of Cell Biology, Center for Cancer Research, National Cancer Institute, NIH, Bethesda, Maryland. 2Laboratory of Cancer Biology and Genetics, Center for Cancer Research, National Cancer Institute, NIH, Bethesda, Maryland. 3Surgical Neurology Branch, National Institute of Neurological Disorders and Stroke, NIH, Bethesda, Maryland. 4Laboratory of Cell Biology, Center for Cancer Research, National Cancer Institute, NIH, Bethesda, Maryland. mgottesman@nih.gov. Despite early positive response to platinum-based chemotherapy, the majority of ovarian carcinomas develop resistance and progress to fatal disease. Protein phosphatase 2A (PP2A) is a ubiquitous phosphatase involved in the regulation of DNA-damage response (DDR) and cell-cycle checkpoint pathways. Recent studies have shown that LB100, a small-molecule inhibitor of PP2A, sensitizes cancer cells to radiation-mediated DNA damage. We hypothesized that LB100 could sensitize ovarian cancer cells to cisplatin treatment. We performed in vitro studies in SKOV-3, OVCAR-8, and PEO1, -4, and -6 ovarian cancer lines to assess cytotoxicity potentiation, cell-death mechanism(s), cell-cycle regulation, and DDR signaling. In vivo studies were conducted in an intraperitoneal metastatic mouse model using SKOV-3/f-Luc cells. LB100 sensitized ovarian carcinoma lines to cisplatin-mediated cell death. Sensitization via LB100 was mediated by abrogation of cell-cycle arrest induced by cisplatin. Loss of the cisplatin-induced checkpoint correlated with decreased Wee1 expression, increased cdc2 activation, and increased mitotic entry (p-histone H3). LB100 also induced constitutive hyperphosphorylation of DDR proteins (BRCA1, Chk2, and γH2AX), altered the chronology and persistence of JNK activation, and modulated the expression of 14-3-3 binding sites. In vivo, cisplatin sensitization via LB100 significantly enhanced tumor growth inhibition and prevented disease progression after treatment cessation. Our results suggest that LB100 sensitizes ovarian cancer cells to cisplatin in vitro and in vivo by modulation of the DDR pathway and cell-cycle checkpoint abrogation. SETD2 is a histone methyltransferase that is specific for lysine-36 of histone H3, and methylation of this residue is associated with active chromatin and chromatin remodeling. SETD2 loss-of-function promotes renal cancer branched evolution through replication stress and impaired DNA repair. Kanu N, Grönroos E, Martinez P, Burrell RA, Yi Goh X, Bartkova J, Maya-Mendoza A, Mistrík M, Rowan AJ, Patel H, Rabinowitz A, East P, Wilson G, Santos CR, McGranahan N, Gulati S, Gerlinger M, Birkbak NJ, Joshi T, Alexandrov LB, Stratton MR, Powles T, Matthews N, Bates PA, Stewart A, Szallasi Z, Larkin J, Bartek J, Swanton C.
Arch Toxicol. 2015 Jun;89(6):899-921. doi: 10.1007/s00204-015-1474-0. Epub 2015 Feb 22. Loss of MLH1 confers resistance to PI3Kβ inhibitors in renal clear cell carcinoma with SETD2 mutation. Feng C, Ding G, Jiang H, Ding Q, Wen H.
Tumour Biol. 2015 May;36(5):3457-64. doi: 10.1007/s13277-014-2981-y. Epub 2014 Dec 21. SETD2-dependent histone H3K36 trimethylation is required for homologous recombination repair and genome stability. Pfister SX, Ahrabi S, Zalmas LP, Sarkar S, Aymard F, Bachrati CZ, Helleday T, Legube G, La Thangue NB, Porter AC, Humphrey TC. Cell Rep. 2014 Jun 26;7(6):2006-18. doi: 10.1016/j.celrep.2014.05.026. Epub 2014 Jun 12. SETD2 is required for DNA double-strand break repair and activation of the p53-mediated checkpoint. Carvalho S, Vítor AC, Sridhara SC, Martins FB, Raposo AC, Desterro JM, Ferreira J, de Almeida SF. Elife. 2014 May 6;3:e02482. doi: 10.7554/eLife.02482. Ahn JW, Kim HS, Yoon JK, Jang H, Han SM, Eun S, Shim HS, Kim HJ, Kim DJ, Lee JG, Lee CY, Bae MK, Chung KY, Jung JY, Kim EY, Kim SK, Chang J, Kim HR, Kim JH, Lee MG, Cho BC, Lee JH, Bang D.
Genome Med. 2014 Feb 27;6(2):18. doi: 10.1186/gm535. eCollection 2014. The histone mark H3K36me3 regulates human DNA mismatch repair through its interaction with MutSα. Li F, Mao G, Tong D, Huang J, Gu L, Yang W, Li GM. Cell. 2013 Apr 25;153(3):590-600. doi: 10.1016/j.cell.2013.03.025. 1 Recruiting A Study of AZD1775 + Chemotherapy Versus Chemotherapy in Patients to Treat Ovarian, Fallopian Tube, Peritoneal Cancer. This randomized phase II clinical trial studies how well gemcitabine hydrochloride and WEE1 inhibitor MK-1775 work compared to gemcitabine hydrochloride alone in treating patients with ovarian, primary peritoneal, or fallopian tube cancer that has come back after a period of time. Gemcitabine hydrochloride may prevent tumor cells from multiplying by damaging their deoxyribonucleic acid (DNA, molecules that contain instructions for the proper development and functioning of cells), which in turn stops the tumor from growing. The protein WEE1 may help to repair the damaged tumor cells, so the tumor continues to grow. 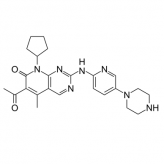 WEE1 inhibitor MK-1775 may block the WEE1 protein activity and may increase the effectiveness of gemcitabine hydrochloride by preventing the WEE1 protein from repairing damaged tumor cells without causing harm to normal cells. It is not yet known whether gemcitabine hydrochloride with or without WEE1 inhibitor MK-1775 may be an effective treatment for recurrent ovarian, primary peritoneal, or fallopian tube cancer. Survival estimates will be computed using the Kaplan-Meier method. To estimate the maximum tolerated dose (MTD) and/or recommended Phase 2 dose of MK-1775 (WEE1 inhibitor MK-1775) administered on days 1 through 5 every 21 days, in combination with oral irinotecan (irinotecan hydrochloride), to children with recurrent or refractory solid tumors. To define and describe the toxicities of MK-1775 in combination with oral irinotecan administered on this schedule. III. To characterize the pharmacokinetics of MK-1775 in children with refractory cancer. To preliminarily define the antitumor activity of MK-1775 and irinotecan within the confines of a Phase 1 study. To obtain initial Phase 2 efficacy data on the anti-tumor activity of MK-1775 in combination with irinotecan administered to children with relapsed or refractory neuroblastoma and in children with relapsed or refractory medulloblastoma/CNS PNET (central nervous system primitive neuroectodermal tumor). III. To investigate checkpoint over-ride by MK-1775 via the mechanism-based pharmacodynamic (PD) biomarker of decreased cyclin-dependent kinase 1 (CDK1) phosphorylation in correlative and exploratory studies. To evaluate potential predictive biomarkers of MK-1775 sensitivity, including v-myc avian myelocytomatosis viral oncogene homolog (MYC), v-myc avian myelocytomatosis viral oncogene neuroblastoma derived homolog (MYCN), phosphorylated-WEE1 G2 checkpoint kinase (p-Wee1), enhancer of zeste homolog 2 (Drosophila) (EZH2) and gamma-H2A histone family, member X (H2AX) in tumor tissues in correlative and exploratory studies. Are Cyclin D and cdk Inhibitors A Good Target for Chemotherapy? The U.S. Food and Drug Administration today granted accelerated approval to Ibrance (palbociclib) to treat advanced (metastatic) breast cancer inr postmenopausal women with estrogen receptor (ER)-positive, human epidermal growth factor receptor 2 (HER2)-negative metastatic breast cancer who have not yet received an endocrine-based therapy. It is to be used in combination with letrozole, another FDA-approved product used to treat certain kinds of breast cancer in postmenopausal women. Palbociclib and LY2835219 are both cyclin-dependent kinase (CDK) 4/6 inhibitors. CDK4 and CDK6 are kinases that, together with cyclin D1, facilitate the transition of dividing cells from the G1 to the S (synthesis) phase of the cell cycle. Preclinical studies have shown that breast cancer cells rely on CDK4 and CDK6 for division and growth, and that selective CDK4/6 inhibitors can arrest the cells at this G1/S phase checkpoint. The results of the phase II trial of palbociclib and phase I trial of LY2835219 both indicated that hormone receptor (HR)-positive disease appears to be the best marker to predict patient response. The CDK4/6 inhibitor LY2835219 has demonstrated early activity in heavily pretreated women with metastatic breast cancer. Nineteen percent of these women (9 out of 47) had a partial response and 51% (24 out of 47) had stable disease following monotherapy with the oral CDK4/6 inhibitor. Patients had received a median of seven prior therapies, and 75% had metastatic disease in the lung, liver, or brain. The median age of patients was 55 years. All of the partial responses were in patients with HR-positive disease. The overall response rate for this patient subset was 25% (9 of 36 patients). Twenty of the patients with stable disease had HR-positive disease, with 13 patients having stable disease lasting 24 weeks or more. Despite treatment, disease progression occurred in 23% of the patients. These results were presented at a press briefing by Amita Patnaik, MD, associate director of clinical research at South Texas Accelerated Research Therapeutics in San Antonio, Texas, at the 2014 American Association for Cancer Research (AACR) Annual Meeting, held April 5–9, in San Diego. The phase I trial of LY2835219 enrolled 132 patients with five different tumor types, including metastatic breast cancer. Patients received 150-mg to 200-mg doses of the oral drug every 12 hours. The overall disease control rate was 70% for all patients and 81% among the 36 HR-positive patients. The median progression-free survival (PFS) was 5.8 months for all patients and 9.1 months for HR-positive patients. Patnaik noted that the median PFS is still a moving target, as 18 patients, all with HR-positive disease, remain on therapy. “The data are rather encouraging for a very heavily pretreated patient population,” said Patnaik during the press briefing. Even though the trial was not designed to compare efficacy based on breast cancer subpopulations, the results in HR-positive tumors are particularly encouraging, according to Patnaik. Common adverse events thought to be treatment-related were diarrhea, nausea, fatigue, vomiting, and neutropenia. These adverse events occurred in 5% or less of patients at grade 3 or 4 toxicity, except neutropenia, which occurred as a grade 3 or 4 toxicity in 11% of patients. Patnaik noted during the press briefing that the neutropenia was uncomplicated and did not result in discontinuation of therapy by any of the patients. The addition of the oral CDK4/6 inhibitor palbociclib resulted in an almost doubling of PFS in first-line treatment of postmenopausal metastatic breast cancer patients with HR-positive disease compared with a control population. The patients in this trial were not previously treated for their metastatic breast cancer, unlike the patient population in the phase I LY2835219 trial. Patients receiving the combination of palbociclib at 125 mg once daily plus letrozole at 2.5 mg once daily had a median PFS of 20.2 months compared with a median of 10.2 months for patients treated with letrozole alone (hazard ratio = 0.488; P = .0004). Richard S. Finn, MD, assistant professor of medicine at the University of California, Los Angeles, presented the data from the phase II PALOMA-1 trial at a press briefing at the AACR Annual Meeting. A total of 165 patients were randomized 1:1 to either the experimental arm or control arm. Forty-three percent of patients in the combination arm had an objective response compared with 33% of patients in the control arm. Overall survival (OS), a secondary endpoint in this trial, was encouraging but the results are still preliminary, said Finn during the press briefing. The median OS was 37.5 months in the palbociclib arm compared with 33.3 months in the letrozole alone arm (P = .21). Finn noted that long-term follow-up is necessary to establish the median OS. “This first look of the survival data is encouraging. This is a front-line study, and it is encouraging that there is early [separation] of the curves,” he said. No new toxicities were reported since the interim trial results. Common adverse events included leukopenia, neutropenia, and fatigue. The neutropenia could be quickly resolved and was uncomplicated and not accompanied by fever, said Finn. Palbociclib is currently being tested in two phase III clinical trials: The PALOMA-3 trial is testing the combination of palbociclib with letrozole and fulvestrant in late-stage metastatic breast cancer patients who have failed endocrine therapy. The PENELOPE-B trial is testing palbociclib in combination with standard endocrine therapy in HR-positive breast cancer patients with residual disease after neoadjuvant chemotherapy and surgery. Patnaik A, Rosen LS, Tolaney SM, et al. Clinical activity of LY2835219, a novel cell cycle inhibitor selective for CDK4 and CDK6, in patients with metastatic breast cancer. American Association for Cancer Research Annual Meeting 2014; April 5–9, 2014; San Diego. Abstr CT232. Finn RS, Crown JP, Lang I, et al. Final results of a randomized phase II study of PD 0332991, a cyclin-dependent kinase (CDK)-4/6 inhibitor, in combination with letrozole vs letrozole alone for first-line treatment of ER+/HER2-advanced breast cancer (PALOMA-1; TRIO-18). American Association for Cancer Research Annual Meeting 2014; April 5–9, 2014; San Diego. Abstr CT101. Cell Cycle. 2012 Nov 1; 11(21): 3913. See the article “Therapeutic response to CDK4/6 inhibition in breast cancer defined by ex vivo analyses of human tumors” in volume 11 on page 2756. See the article “CDK4/6 inhibition antagonizes the cytotoxic response to anthracycline therapy” in volume 11 on page 2747. Two recent papers from the Knudsen laboratory make several important observations that will help guide the continued clinical development of CDK4/6 inhibitors. In the study by Dean et al., surgically resected patient breast tumors were grown on a tissue culture matrix in the presence or absence of PD0332991. Crucially, these cultures retained associated stromal components known to play important roles in cancer pathogenesis and therapeutic sensitivities, as well as key histological and molecular features of the primary tumor, including expression of ER, HER2 and Ki-67. Similar to results in breast cancer cell lines,6 the authors demonstrate that only RB-positive tumors have growth inhibition in response to PD0332991, irrespective of ER or HER2 status, while tumors lacking RB were completely resistant. This result underscores RB as the predominant target of CDK4/6 in breast cancer cells and the primary marker of drug response in primary patient-derived tumors. As expected, RB-negative tumors routinely demonstrated robust expression of p16INK4A; however, p16INK4A expression was not always a surrogate marker for RB loss, supporting the importance of direct screening of tumors for RB expression to select patients appropriate for CDK4/6 inhibitor clinical trials. In the second study, McClendon et al. investigated the efficacy of PD0332991 in combination with doxorubicin in triple-negative breast cancer cell lines. Again, RB functionality was paramount in determining response to either PD0332991 monotherapy or combination treatment. In RB-deficient cancer cells, CDK4/6 inhibition had no effect in either instance. However, in RB-expressing cancer cells, CDK4/6 inhibition and doxorubicin provided a cooperative cytostatic effect, although doxorubicin-induced cytotoxicity was substantially reduced, assessed by markers for mitotic catastrophe and apoptosis. Additionally, despite cytostatic cooperativity, CDK4/6 inhibition maintained the viability of RB-proficient cells in the presence of doxorubicin, which repopulated the culture after removal of drug. These results reflect previous data demonstrating that ectopic expression of p16INK4A can protect cells from the lethal effects of DNA damaging and anti-mitotic chemotherapies.7 Similar results have been reported in MMTV-c-neu mice bearing RB-proficient HER2-driven tumors, where PD0332991 compromised carboplatin-induced regressions,8 suggesting that DNA-damaging treatments should not be combined concomitantly with CDK4/6 inhibition in RB-proficient tumors. In summary, the current work provides evidence for RB expression as a determinant of response to CDK4/6 inhibition in primary tumors and highlights the complexity of combining agents targeting the cell cycle machinery with DNA damaging treatments. Dean JL, McClendon AK, Hickey TE, Butler LM, Tilley WD, Witkiewicz AK, Knudsen ES. Therapeutic response to CDK4/6 inhibition in breast cancer defined by ex vivo analyses of human tumors Cell Cycle 2012 11 2756 61 doi: 10.4161/cc.21195. McClendon AK, Dean JL, Rivadeneira DB, Yu JE, Reed CA, Gao E, Farber JL, Force T, Koch WJ, Knudsen ES. CDK4/6 inhibition antagonizes the cytotoxic response to anthracycline therapy Cell Cycle 2012 11 2747 55 doi: 10.4161/cc.21127. Cell Cycle. 2012 Jul 15; 11(14): 2756–2761. See commentary “Cyclin-dependent kinase 4/6 inhibition in cancer therapy” in volume 11 on page 3913. To model the heterogeneity of breast cancer as observed in the clinic, we employed an ex vivo model of breast tumor tissue. This methodology maintained the histological integrity of the tumor tissue in unselected breast cancers, and importantly, the explants retained key molecular markers that are currently used to guide breast cancer treatment (e.g., ER and Her2 status). The primary tumors displayed the expected wide range of positivity for the proliferation marker Ki67, and a strong positive correlation between the Ki67 indices of the primary and corresponding explanted tumor tissues was observed. Collectively, these findings indicate that multiple facets of tumor pathophysiology are recapitulated in this ex vivo model. To interrogate the potential of this preclinical model to inform determinants of therapeutic response, we investigated the cytostatic response to the CDK4/6 inhibitor, PD-0332991. This inhibitor was highly effective at suppressing proliferation in approximately 85% of cases, irrespective of ER or HER2 status. However, 15% of cases were completely resistant to PD-0332991. Marker analyses in both the primary tumor tissue and the corresponding explant revealed that cases resistant to CDK4/6 inhibition lacked the RB-tumor suppressor. These studies provide important insights into the spectrum of breast tumors that could be treated with CDK4/6 inhibitors, and defines functional determinants of response analogous to those identified through neoadjuvant studies. Breast cancer is a highly heterogeneous disease.1–4 Such heterogeneity is known to influence patient response to both standard of care and experimental therapeutics. In regards to biomarker-driven treatment of breast cancers, it was initially recognized that the presence of the estrogen receptor α (ER) in a fraction of breast cancer cells was associated with the response to tamoxifen and similar anti-estrogenic therapies.5,6 Since this discovery, subsequent marker analyses and gene expression profiling studies have further divided breast cancer into a series of distinct subtypes that harbor differing and often divergent therapeutic sensitivities.1–3 While clearly important in considering the use of several current standard of care therapies, these markers, or molecular sub-types, do not necessarily predict the response to new therapeutic approaches that are currently undergoing clinical development. Thus, there is the continued need for functional analyses of drug response and the definition of new markers that can be used to direct treatment strategies. Currently, all preclinical cancer models are associated with specific limitations. It is well known that cell culture models lack the tumor microenvironment known to have a significant impact on tumor biology and therapeutic response.7–9 Xenograft models are dependent on the host response for the engraftment of tumor cells in non-native tissues, which do not necessarily recapitulate the nuances of complex tumor milieu.10 In addition, genetically engineered mouse models, while enabling the tumor to develop in the context of the host, can develop tumors that do not mirror aspects of human disease.10 Furthermore, it remains unclear whether any preclinical model truly represents the panoply of breast cancer subtypes that are observed in the clinic. Herein, we utilized a primary human tumor explant culture approach to interrogate drug response, as well as specific determinants of therapeutic response, in an unselected series of breast cancer cases. Cell Cycle. 2012 Jul 15; 11(14): 2747–2755. Triple-negative breast cancer (TNBC) is an aggressive disease that lacks established markers to direct therapeutic intervention. Thus, these tumors are routinely treated with cytotoxic chemotherapies (e.g., anthracyclines), which can cause severe side effects that impact quality of life. Recent studies indicate that the retinoblastoma tumor suppressor (RB) pathway is an important determinant in TNBC disease progression and therapeutic outcome. Furthermore, new therapeutic agents have been developed that specifically target the RB pathway, potentially positioning RB as a novel molecular marker for directing treatment. The current study evaluates the efficacy of pharmacological CDK4/6 inhibition in combination with the widely used genotoxic agent doxorubicin in the treatment of TNBC. Results demonstrate that in RB-proficient TNBC models, pharmacological CDK4/6 inhibition yields a cooperative cytostatic effect with doxorubicin but ultimately protects RB-proficient cells from doxorubicin-mediated cytotoxicity. In contrast, CDK4/6 inhibition does not alter the therapeutic response of RB-deficient TNBC cells to doxorubicin-mediated cytotoxicity, indicating that the effects of doxorubicin are indeed dependent on RB-mediated cell cycle control. Finally, the ability of CDK4/6 inhibition to protect TNBC cells from doxorubicin-mediated cytotoxicity resulted in recurrent populations of cells specifically in RB-proficient cell models, indicating that CDK4/6 inhibition can preserve cell viability in the presence of genotoxic agents. Combined, these studies suggest that while targeting the RB pathway represents a novel means of treatment in aggressive diseases such as TNBC, there should be a certain degree of caution when considering combination regimens of CDK4/6 inhibitors with genotoxic compounds that rely heavily on cell proliferation for their cytotoxic effects. Sara Tolaney, MD, MPH, a breast oncologist with the Susan F. Smith Center for Women’s Cancers at Dana-Farber Cancer Institute, gives an overview of phase I clinical trials and some of the new drugs being tested to treat breast cancer. This talk was originally given at the Metastatic Breast Cancer Forum at Dana-Farber on Oct. 5, 2013. As discussed in earlier posts and the Introduction to this chapter on Cytotoxic Chemotherapeutics, most anti-cancer drugs developed either to target DNA, DNA replication, or the cell cycle usually have similar toxicity profile which can limit their therapeutic use. These toxicities and adverse events usually involve cell types which normally exhibit turnover in the body, such as myeloid and lymphoid and granulocytic series of blood cells, epithelial cells lining the mucosa of the GI tract, as well as follicular cells found at hair follicles. This understandably manifests itself as common toxicities seen with these types of agents such as the various cytopenias in the blood, nausea vomiting diarrhea (although there are effects on the chemoreceptor trigger zone), and alopecia. studies, reproductive toxicity studies, pharmacokinetic studies, toxicokinetic studies and repeat-dose general toxicity studies which were conducted in rats and dogs. The pivotal toxicology studies were conducted in compliance with Good Laboratory Practice regulation. respectively) based on mean unbound Cmax. Palbociclib was studied in single dose toxicity studies and repeated dose studies in rats and dogs. Adverse effects in the bone marrow, lymphoid tissues, and male reproductive organs were observed at clinically relevant exposures. Partial to complete reversibility of toxicities to the hematolymphopoietic and male reproductive systems was demonstrated following a recovery period (4-12 weeks), with the exception of the male reproductive organ findings in dogs. Gastrointestinal, liver, kidney, endocrine/metabolic (altered glucose metabolism), respiratory, ocular, and adrenal effects were also seen. mg/kg/day (10x human exposure at the therapeutic dose) in an in vivo rat micronucleus assay. Reproductive toxicology: No effects on estrous cycle and no reproductive toxicities were noticed in standard assays. Deaths Associated With Trials: Although a few deaths occurred during some trials no deaths were attributed to the drug. Melanoma represents approximately 4% of human skin cancers, yet accounts for approximately 80% of deaths from cutaneous neoplasms. It remains one of the most common types of cancer among young adults. Melanoma is recognized as the most common fatal skin cancer with its incidence rising to 15 fold in the past 40 years in the United States. Melanoma develops from the malignant transformation of melanocytes, the pigment-producing cells that reside in the basal epidermal layer in human skin. (Greenlee RT, et al, Cancer J Clin. Jan-Feb 2001;51(1):15-36 ; Weinstock MA, et al, Med Health R I. Jul 2001;84(7):234-6). Classic clinical signs of melanoma include change in color, recent enlargement, nodularity, irregular borders, and bleeding. Cardinal signs of melanoma are sometimes referred to by the mnemonic ABCDEs (asymmetry, border irregularity, color, diameter, elevation) (Chudnovsky Y, et al. J Clin Invest, 1 April 2005; 115(4): 813–824). a history of severe sunburn at any time in life. Use of this risk-factor chart should enable preventive advice for and surveillance of those at greatest risk (MacKie RM, et al, Lancet 26 Aug1989;2(8661):487-90). Cutaneous melanoma can be subdivided into several subtypes, primarily based on anatomic location and patterns of growth (Table 1). As in many cancers, both genetic predisposition and exposure to environmental agents are risk factors for melanoma development. Many studies conducted over several decades on benign and malignant melanocytic lesions as well as melanoma cell lines have implicated numerous genes in melanoma development and progression. Apart from the risk factors such as skin pigmentation, freckling, and so on, another significant risk factor is ‘strong family history of melanoma’. Older case-control studies of patients with familial atypical mole-melanoma (FAMM) syndrome suggested an elevated risk of ∼434-to 1000-fold over the general population (Greene MH, et al, Ann Intern Med, Apr 1985;102(4):458-65). A more recent meta-analysis of family history found that the presence of at least one first-degree relative with melanoma increases the risk by 2.24-fold (Gandini S, et al, Eur J Cancer, Sep 2005;41(14):2040-59). Genetic studies of melanoma-prone families have given important clues regarding melanoma susceptibility loci. CDKN2A is located at chromosome 9p21 and is composed of 4 exons (E) – 1α, 1β, 2, and 3. LOH or mutations at this locus cosegregated with melanoma susceptibility in familial melanoma kindred and 9p21 mutations have been observed in different cancer cell lines. The locus encodes two tumor suppressors via alternate reading frames, INK4 (p16INK4a) and ARF (p14ARF). INK4A and ARF encode alternative first exons, 1α and 1β respectively and different promoters. INK4A is translated from the splice product of E1α, E2, and E3, while ARF is translated from the splice product of E1β, E2, and E3. Second exons of the two proteins are shared and two translated proteins share no amino acid homology. INK4A is the founding member of the INK4 (Inhibitor of cyclin-dependent kinase 4) family of proteins and inhibits the G1 cyclin-dependent kinases (CDKs) 4/6, which phosphorylate and inactivate the retinoblastoma protein (RB), thereby allowing for S-phase entry. Thus, loss of INK4K function promotes RB inactivation through hyperphosphorylation, resulting in unconstrained cell cycle progression. ARF (Alternative Reading Frame) protein of the locus inhibits HDM2-mediated ubiquitination and subsequent degradation of p53. Thus, loss of ARF inactivates another tumor suppressor, p53. The loss of p53 impairs mechanisms that normally target genetically damaged cells for cell cycle arrest and/or apoptosis, which leads to proliferation of damaged cells. Loss of CDKN2A therefore contributes to tumorigenesis by disruption of both the pRB and p53 pathways. Figure 1: Genetic encoding and mechanism of action of INK4A and ARF. A genetic hallmark of melanoma is the presence of activating mutations in the oncogenes BRAF and NRAS, which are present in 70% and 15% of melanomas, respectively, and lead to constitutive activation of mitogen-activated protein kinase (MAPK) pathway signaling. However, molecules that inhibit MAPK pathway–associated kinases, like BRAF and MEK, have shown only limited efficacy in the treatment of metastatic melanoma. Thus, a deeper understanding of the cross talk between signaling networks and the complexity of melanoma progression should lead to more effective therapy. 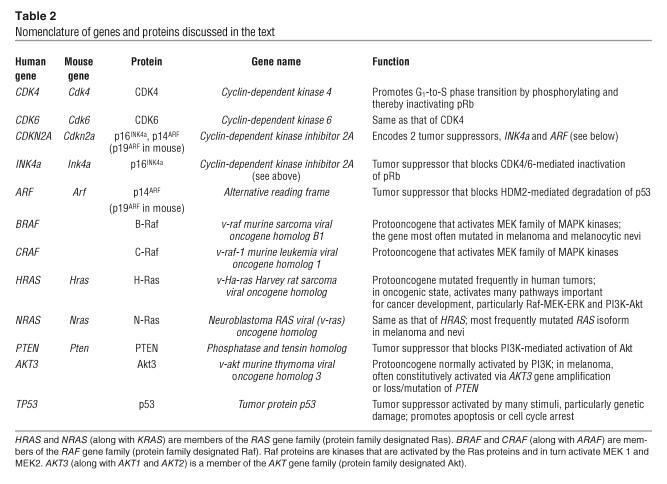 NRAS mutations activate both effector pathways, Raf-MEK-ERK and PI3K-Akt in melanoma. The Raf-MEK-ERK pathway may also be activated via mutations in the BRAF gene. In a subset of melanomas, the ERK kinases have been shown to be constitutively active even in the absence of NRAS or BRAF mutations. The PI3K-Akt pathway may be activated through loss or mutation of the tumor suppressor gene PTEN, occurring in 30–50% of melanomas, or through gene amplification of the AKT3 isoform. 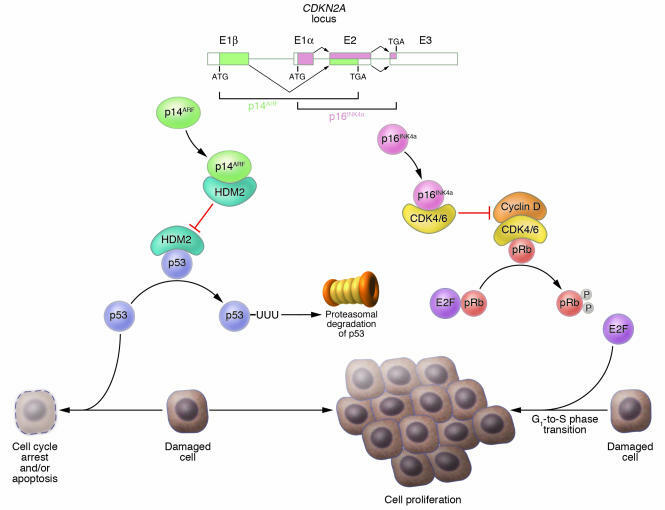 Activation of ERK and/or Akt3 promotes the development of melanoma by various mechanisms, including stimulation of cell proliferation and enhanced resistance to apoptosis. 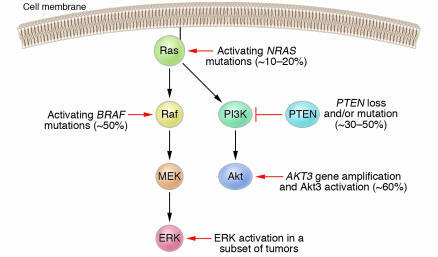 Figure 2: Schematic of the canonical Ras effector pathways Raf-MEK-ERK and PI3K-Akt in melanoma. Curtin et al (2005) compared genome-wide alterations in the number of copies of DNA and mutational status of BRAF and NRAS in 126 melanomas from four groups in which the degree of exposure to ultraviolet light differs: 30 melanomas from skin with chronic sun-induced damage and 40 melanomas from skin without such damage; 36 melanomas from palms, soles, and subungual (acral) sites; and 20 mucosal melanomas. Significant differences were observed in number of copies of DNA and mutation frequencies in BRAF among the four groups of melanomas. Eighty-one percent of the melanomas on skin without sun-induced damaged had mutations in BRAF or NRAS. Melanomas with wild-type BRAF or NRAS frequently had increases in the number of copies of the genes for cyclin-dependent kinase 4 (CDK4) and cyclin D1 (CCND1), downstream components of the RAS-BRAF pathway. Thus, the genetic alterations identified in melanomas at different sites and with different levels of sun exposure indicate that there are distinct genetic pathways in the development of melanoma and implicate CDK4 and CCND1 as independent oncogenes in melanomas without mutations in BRAF or NRAS. (Curtin JA, et al, N Engl J Med, 17 Nov 2005;353(20):2135-47). Melanoma exhibits molecular heterogeneity with markedly distinct biological and clinical behaviors. Lentigo maligna melanomas, for example, are indolent tumors that develop over decades on chronically sun-exposed area such as the face. Acral lentigenous melanoma, or the other hand, develops on sun-protected regions, tend to be more aggressive. Also, transcription profiling has provided distinct molecular subclasses of melanoma. It is also speculated that alterations at the DNA and RNA and the non-random nature of chromosomal aberrations may segregate melanoma tumors into subtypes with distinct clinical behaviors. Whole-genome screening technologies such as spectral karyotype analysis and array-CGH have identified many recurrent nonrandom chromosomal structural alterations, particularly in chromosomes 1, 6, 7, 9, 10, and 11 (Curtin JA, et al, N Engl J Med, 17 Nov 2005;353(20):2135-47); however, in most cases, no known or validated targets have been linked to these alterations. In A systematic high-resolution genomic analysis of melanocytic genomes, array-CGH profiles of 120 melanocytic lesions, including 32 melanoma cell lines, 10 benign melanocytic nevi, and 78 melanomas (primary and metastatic) by Chin et al (2006) revealed a level of genomic complexity not previously appreciated. In total, 435 distinct copy number aberrations (CNAs) were defined among the metastatic lesions, including 163 recurrent, high-amplitude events. These include all previously described large and focal events (e.g., 1q gain, 6p gain/6q loss, 7 gain, 9p loss, and 10 loss). Genomic complexity observed in primary and benign nevi melanoma is significantly less than that observed in metastatic melanoma (Figure 3) (Chin L, et al, Genes Dev. 15 Aug 2006;20 (16):2149-2182). Thus, genomic profiling of various melanoma progression types could reveal important information regarding genetic events those likely drive as metastasis and possibly, reveal provide cues regarding therapy targeted against melanoma. Thymosin alpha1 and melanoma Author/Editor- Tilda Barliya, Ph.D.
A New Therapy for Melanoma Reporter- Larry H Bernstein, M.D. Melanoma: Molecule in Immune System Could Help Treat Dangerous Skin Cancer Reporter: Prabodh Kandala, Ph.D.
Why Braf inhibitors fail to treat melanoma. Reporter: Prabodh Kandala, Ph.D.
‘Triple negative breast cancer’ or TNBC, as the name suggests, is a classification of breast cancers lacking the expression of estrogen receptor (ER) and progesterone receptor expression as well as amplification of the human epidermal growth factor receptor 2 (HER2). Unlike other breast cancer types, treating TNBC is a challenge mainly because of the absence of well-defined molecular targets and because of disease heterogeneity. Currently, neoadjuvant chemotherapies are in use to treat TNBC patients. Some, around 30%, patients respond completely to neoadjuvant chemotherapy and have good outcomes after surgery. However, if there is a residual disease after therapy, outcomes are poor. Therefore, current focus of the field is to first understand the complexity of the disease, both at genomic and molecular level and look for targets. Also, several combination chemotherapies are currently under trial to determine the efficacy, overall response rate, progression-free survival and other relevant factors for patients suffering with different forms of TNBC. Triple Negative Breast Cancer: Subtypes, Molecular Targets, and Therapeutic Approaches, Pietenpol JA, Vanderbilt-Ingram Cancer Center; Vanderbilt University School of Medicine (Nashville, TN), Abstract no. ES2-2. The pharmacological drugs were chosen on the basis of the genetic pathways active in the cell lines with the abovementioned TNBC subtypes. It was observed that BL1 and BL2 subtype cell lines respond to cisplatin. Mesenchymal, basal, and luminal subtype lines with aberrations in PI3K signaling and have the greatest sensitivity to PI3K inhibitors. The LAR subtype cell lines express AR and are uniquely sensitive to bicalutamide (AR antagonist). The experiment was a proof-of-concept that the best therapy could be based on TNBC subtypes. The group has also developed a web-based subtyping tool referred to as “TNBCtype,” for candidate TNBC tumor samples using our gene expression metadata and classification methods. The approach would enable alignment of TNBC patients to appropriate targeted therapies. The Clonal and Mutational Composition of Triple Negative Breast Cancers: Aparicio S, University of British Columbia (Vancouver, BC), Canada. Abstract no. ES2-3. The abstract is on the same lines, TNBC heterogeneity that is. The concept of clonal heterogeneity in cancers, the spatial and temporal variation in clonal composition, is the focal point of the discussion. The group has developed next generation sequencing approaches and applied them to the understanding of mutational and clonal composition of primary TNBC. They have demonstrated that both mutational composition and clonal structure of primary TNBC is in fact a complete spectrum, a notion that is far from the previous one that stated TNBC to be a distinct disease. The authors add “clonal analysis suggests a means by which the genetic complexity might be reduced by following patient evolution over time and space.” The specific implications of the mutational and transcriptome landscapes of TNBC in relation to possible disease biologies were discussed in the symposium. In the absence of hormone receptors and hence lack of targets, Neoadjuvant chemotherapy (NAC) is increasingly used in patients with TNBC. NAC can induce a pathologic complete response (pCR) in ∼30% of patients which portends a favorable prognosis. In contrast, patients with residual disease (RD) in the breast at surgical resection exhibit worse outcomes. The authors hypothesize that “profiling residual TNBC after NAC would identify molecularly targetable lesions in the chemotherapy resistant component of the tumor and that the persistent tumor cells would mirror micro-metastases which ultimately recur in such patients.” The researchers utilized targeted next generation sequencing (NGS) for 182 oncogenes and tumor suppressors in a CLIA certified lab (Foundation Medicine, Cambridge, MA) and gene expression profiling (NanoString) of the RD after NAC in 102 patients with TNBC. The RD was stained for Ki67, which has been reported to predict outcome after NAC in unselected breast cancers. Out of the 89 evaluable post-NAC tumors, 57 (64%) were basal-like; 19% HER2-enriched; 6% luminal A; 6% luminal B and 5% normal-like. Of 81 tumors evaluated by NGS, 89% demonstrated mutations in TP53, 27% were MCL1-amplified, and 21% were MYC-amplified. Sporadic growth factor receptor (amplifications occurred in EGFR, KIT, PDGFRA, PDGFRB, MET, FGFR1, FGFR2, and IGF1R. NGS identified 7 patients with ERBB2 gene amplification. NGS could assist in the identification of ERBB2-overexpressing tumors misclassified at the time of diagnosis. Amplifications of MYC were independently associated with poor recurrence-free survival (RFS) and overall survival (OS). In contrast to the earlier notion, high post-NAC Ki67 score did not predict poor RFS or OS in this predominantly TNBC cohort. The researchers performed a shRNA synthetic-lethal screen in the human mammary epithelial cells (HMEC), to identify new molecules, such as cell cycle kinases, which when inhibited can preferentially kill TNBC cells. A high-throughput screen of ∼2000 shRNAs, that target the human kinome (∼ 600 kinases) when performed, led to the identification of 13 kinases whose inhibition by >1 shRNAs gave rise to >50% inhibition of cell growth. ARK5 and GSK3A were the two other kinases that were shown to have a synthetic-lethal interaction with MYC. Since these two kinases have been identified in other studies, it gives validity to the ability to the methods of Goga etal in identifying synthetic-lethal targets. The group is currently characterizing and validating the 11 novel targets identified in this screen, using human cancer cell lines as well as mouse cancer models to determine the impact of inhibiting these targets on triple-negative breast cancer development and proliferation. Dent R, etal. Triple-negative breast cancer: clinical features and patterns of recurrence (2007) Clin Cancer Res 13, 4429-4434. Lehmann BD, etal. Identification of human triple-negative breast cancer subtypes and preclinical models for selection of targeted therapies (2011) J Clin Invest. 121: 2750-67. Chen X, etal. TNBCtype: A Subtyping Tool for Triple- Negative Breast Cancer. (2012) Cancer informatics 11, 147-156. Abstracts presented in SABCS 2012 can be accessed here. NO is synthesized by the Nitric Oxide synthase (NOS) enzyme and the enzyme is encoded in three different forms in mammals: neuronal NOS (nNOS or NOS-1), inducible NOS (iNOS or NOS-2), and endothelial NOS (eNOS or NOS-3). The three isoforms, although similar in structure and catalytic function, differ in the way their activity and synthesis in controlled inside a cell. NOS-2, for example is induced in response to inflammatory stimuli, while NOS-1 and NOS-3 are constitutively expressed. NO is a versatile signaling molecule and the net effect of NO on gene regulation is variable and ranges from activation to inhibition of transcription. The intracellular localization is relevant for the activity of NOS. Infact, NOSs are subject to specific targeting to subcellular compartments (plasma membrane, Golgi, cytosol, nucleus and mitochondria) and that this trafficking is crucial for NO production and specific post-translational modifications of target proteins. One in four cases of cancer worldwide are a result of chronic inflammation. An inflammatory response causes high levels of activated macrophages. Macrophage activation, in turn, leads to the induction of iNOS gene that results in the generation of large amount of NO. The expression of iNOS induced by inflammatory stimuli coupled with the constitutive expression of nNOS and eNOS may contribute to increased cancer risk. NO can have varied roles in the tumor environment influencing DNA repair, cell cycle, and apoptosis. It can result in antagonistic actions including DNA damage and protection from cytotoxicity, inhibiting and stimulation cell proliferation, and being both anti-apoptotic and pro-apoptotic. Genotoxicity due to high levels of NO could be through direct modification of DNA (nitrosative deamination of nucleic acid bases, transition and/or transversion of nucleic acids, alkylation and DNA strand breakage) and inhibition of DNA repair enzymes (such as alkyltransferase and DNA ligase) through direct or indirect mechanisms. The Multiple actions of NO are probably the result of its chemical (post-translational modifications) and biological heterogeneity (cellular production, consumption and responses). Post-translational modifications of proteins by nitration, nitrosation, phosphorylation, acetylation or polyADP-ribosylation could lead to an increase in the cancer risk. This process can drive carcinogenesis by altering targets and pathways that are crucial for cancer progression much faster than would otherwise occur in healthy tissue. NO can have several effects even within the tumor microenvironment where it could originate from several cell types including cancer cells, host cells, tumor endothelial cells. Tumor-derived NO could have several functional roles. It can affect cancer progression by augmenting cancer cell proliferation and invasiveness. Infact, it has been proposed that NO promotes tumor growth by regulating blood flow and maintaining the vasodilated tumor microenvironment. NO can stimulate angiogenesis and can also promote metastasis by increasing vascular permeability and upregulating matrix metalloproteinases (MMPs). MMPs have been associated with several functions including cell proliferation, migration, adhesion, differentiation, angiogenesis and so on. Recently, it was reported that metastatic tumor-released NO might impair the immune system, which enables them to escape the immunosurveillance mechanism of cells. Molecular regulation of tumour angiogenesis by nitric oxide. The most prominent and recognized NO reaction with thiols groups of cysteine residues is called S-nitrosylation or S-nitrosation, which leads to the formation of more stable nitrosothiols. High concentrations of intracellular NO can result in high concentrations of S-nitrosylated proteins and dysregulated S-nitrosylation has been implicated in cancer. Oxidative and nitrosative stress is sensed and closely associated with transcriptional regulation of multiple target genes. Following are a few proteins that are modified via NO and modification of these proteins, in turn, has been known to play direct or indirect roles in cancer. Bcl-2 is an important anti-apoptotic protein. It works by inhibiting mitochondrial Cytochrome C that is released in response to apoptotic stimuli. In a variety of tumors, Bcl-2 has been shown to be upregulated, and it has additionally been implicated with cancer chemo-resistance through dysregulation of apoptosis. NO exposure causes S-nitrosylation at the two cysteine residues – Cys158 and Cys229 that prevents ubiquitin-proteasomal pathway mediated degradation of the protein. Once prevented from degradation, the protein attenuates its anti-apoptotic effects in cancer progression. The S-nitrosylation based modification of Bcl-2 has been observed to be relevant in drug treatment studies (for eg. Cisplatin). Thus, the impairment of S-nitrosylated Bcl-2 proteins might serve as an effective therapeutic target to decrease cancer-drug resistance. p53 has been well documented as a tumor suppressor protein and acts as a major player in response to DNA damage and other genomic alterations within the cell. The activation of p53 can lead to cell cycle arrest and DNA repair, however, in case of irrepairable DNA damage, p53 can lead to apoptosis. Nuclear p53 accumulation has been related to NO-mediated anti-tumoral properties. High concentration of NO has been found to cause conformational changes in p53 resulting in biological dysfunction.. In RAW264.7, a murine macrophage cell line, NO donors induce p53 accumulation and apoptosis through JNK-1/2. Hypoxia-inducible factor 1 (HIF1) is a heterodimeric transcription factor that is predominantly active under hypoxic conditions because the HIF-1a subunit is rapidly degraded in normoxic conditions by proteasomal degradation. It regulates the transciption of several genes including those involved in angiogenesis, cell cycle, cell metabolism, and apoptosis. Hypoxic conditions within the tumor can lead to overexpression of HIF-1a. Similar to hypoxia-mediated stress, nitrosative stress can stabilize HIF-1a. NO derivatives have also been shown to participate in hypoxia signaling. Resistance to radiotherapy has been traced back to NO-mediated HIF-1a in solid tumors in some cases. Phosphatase and tensin homolog deleted on chromosome ten (PTEN), is again a tumor suppressor protein. It is a phosphatase and has been implicated in many human cancers. PTEN is a crucial negative regulator of PI3K/Akt signaling pathway. Over-activation of PI3K/Akt mediated signaling pathway is known to play a major role in tumorigenesis and angiogenesis. S-nitrosylation of PTEN, that could be a result of NO stress, inhibits PTEN. Inhibition of PTEN phosphatase activity, in turn, leads to promotion of angiogenesis. C-src belongs to the Src family of protein tyrosine kinases and has been implicated in the promotion of cancer cell invasion and metastasis. It was demonstrated that S-nitrosylation of c-Src at cysteine 498 enhanced its kinase activity, thus, resulting in the enhancement of cancer cell invasion and metastasis.